Dr. Lekha obtained her post-graduation Masters in Surgery (Oto-rhino-laryngology) (ENT) at Sheth G. S. Medical College and K.E.M. Hospital, Mumbai. She received further training in ENT and Voice Surgery under eminent Surgeons at NHS Trust, London. Simultaneously, she qualified a Diploma in Otolaryngology and Head & Neck Surgery (DOHNS) from Royal College of Surgeons of England and MRCS (Membership of Royal College of Surgeons of Edinburgh) from Royal College of Surgeons of Edinburgh. Dr. Lekha went on to obtain a Masters in Voice Pathology at the University College, London, where she received intensive training in all aspects of Voice Pathology from renowned names in the field of Voice. Dr. Lekha K Kapoor has about 20 years of ENT experience starting in KEM Hospital, India, after which she migrated to London where she worked at the National Health Services Hospital, Whipps Cross NHS Hospital for 8 years. Upon her return to Mumbai, India, she worked at a renowned private Hospital, Dr. LH Hiranandani Hospital for one year, and then relocated to Al Zahra Hospital as an ‘A’ ENT specialist. Dr. Lekha’s expertise is in Otology and treating chronic ear problems with and without complications, Endoscopic Sinus Surgeries, Voice Surgeries, Voice Diagnosis and management, and all routine Paediatric ENT treatments including tonsils, adenoids and grommets. 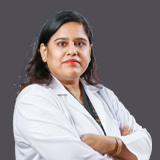 Dr. Lekha speaks English, Hindi, Urdu, Marathi, Gujarati, Punjabi and Arabic. Otology and treating chronic ear problems with and without complications. Endoscopic Sinus Surgeries, Voice Surgeries, Voice Diagnosis and management. Paediatric ENT treatments including tonsils, adenoids and grommets.